Chris Pither has stretched his Dunlop Super2 Series lead by finishing runner-up in Race 1 in Newcastle after Paul Dumbrell came unstuck trying to chase the Kiwi down. Brodie Kostecki took the lead from the outside of the front row and held on to it after a Safety Car restart to claim an all-the-way win as Pither was handed a break when Dumbrell ran off at the top of Watt Street as he closed in. Instead, Pither finished a somewhat distant second to Brodie Kostecki, while Dumbrell was fifth, meaning the margin at the top of the standings grows to 59 points. Pither therefore need only finish seventh in tomorrow’s race to guarantee that the series is his. Brodie Kostecki bested Pither when the lights went out and the Armor All Pole-sitter, who faced an investigation for passing under yellow flags in qualifying, slotted into second. Eggleston Motorsport team-mates Will Brown and Dumbrell took up third and fourth, respectively. Behind, Dean Fiore sailed down the Turn 1 run-off area after copping a sizeable shunt from Thomas Randle in the braking zone. The damage left both the former’s #23 MW Motorsport Nissan Altima and the latter’s #5 Tickford Racing FGX Falcon stranded and necessitated a Safety Car. Fiore’s team-mate Garry Jacobson continued in seventh, having taken an impact with the boot of his #100 Nissan Altima in the incident. Dumbrell went to the outside of Brown for the restart but the latter ran wide in the #38 VF Commodore and compromised the #88 VF Commodore’s run up Watt Street, allowing Shae Davies to take over fourth position. He glanced off the wall and copped a side-on hit from Dumbrell which put the #67 Paul Morris Motorsport FGX Falcon back into the concrete and ultimately out of business. Dumbrell continued and was handed third position by Brown as they climbed Watt Street on Lap 12, at which time Pither was more than three seconds up the road. Pither was the slowest of the top three and Dumbrell had taken around two seconds out of the gap between the two in the next four laps. However, Dumbrell threw that away when he locked a brake and failed to make Turn 2 on Lap 16, dropping to fifth. He would have been sixth if not for Mason Barbera going off the race track in sympathy in the #99 Garry Rogers Motorsport VF Commodore. That mistake effectively decided the top two as Brodie Kostecki took a second race win in the #57 Kostecki Brothers Racing VF Commodore. 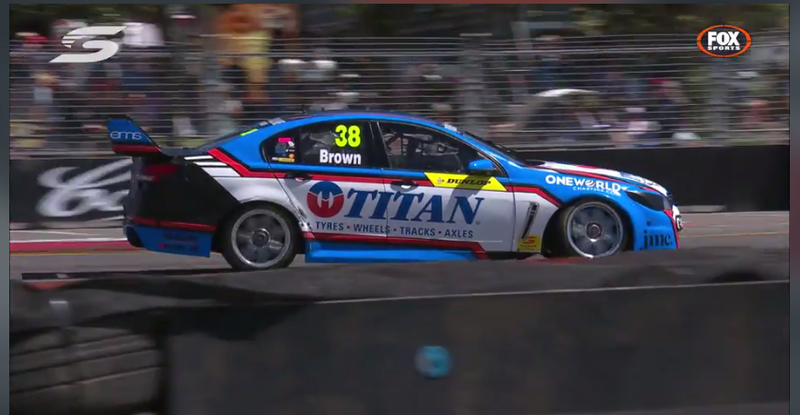 Brown held off Jacobson, who remains mathematically in the fight for the series, to finish third, with Dumbrell almost six seconds behind the 2016 title winner when the chequered flag came out a lap early after 19 laps. Zane Goddard rose to a career-best sixth in the #8 Brad Jones Racing VF Commodore after the multiple incidents in the middle of the top 10. Among those was the Lap 6 goings on between Kurt Kostecki (#55 Kostecki Brothers Racing VF Commodore) and Macauley Jones (#14 Brad Jones Racing VF Commodore), after the former passed the latter at Turn 8 only to be unloaded at Turn 9. Kurt Kostecki went on to finish 18th and Jones one position back after serving a drive-through penalty. Jordan Boys (#49 Image Racing VF Commodore) finished seventh, with Barbera, Jake Kostecki (#56 Kostecki Brothers Racing VF Commodore), and Nathan Morcom (#54 Eggleston Motorsport VF Commodore) rounding out the top 10. Alex Rullo’s series hopes are formally over with his 12th position finish from last on the grid, after shunting his #62 Nissan Altima into team-mate Jacobson in qualifying. The next Super2 session is Armor All Qualifying for Race 2 tomorrow at 1020 local time/AEDT.